"Horology Elaborated by Experts", that is visible in all Hebe watches appeared more than a century ago. It is reflected in all Hebe wrist watch collections, the quality of which has found market acceptance at the international level. In 1900, Constant Périat opened his own workshop in the heart of Jura region in Switzerland. At that time the workshop specialized in the assembly of accurate movements and watch complications. This was the first workshop, where only local residents worked. One year later in 1901 Constant Périat has launched Hebe Watch. In 1948, Gilbert Periat, a son of the founder of the workshop, took the business into his hands and built a new workshop, that still remains today in Alle. The main Periat's goal was to respond to the growing demand in the market of watches. In 1952 — 1965 HEBE brand reached new international frontiers and its production was met with approval in such countries as China, the United States, Cuba, Turkey and in some African countries. In 1965 – 1974, HEBE watch company continued to work with natives, developing new products for the international market. Despite the quartz boom in 1975 — 1990, HEBE company management did not change the line of activity and continued to produce the high-quality watch movements. The company focused on the remote regions. However, to survive under these difficult circumstances, the company released a few quart watches. The watch brand managed to overcome these difficulties under the strict guidance of Héribert PERIAT, a grandson of the brand's founder. In 1990 - 2007, the company continued to manufacture mechanical watches, and in 2008 it introduced the first beautiful skeleton watches and chronographs at the BaselWorld exhibition. The skeleton watches with sapphire crystal with anti-reflective coating were equipped with Swiss ETA 6498 16 ½ movements, and Valjoux 13 1/4 7750 movements were housed in the chronographs' cases. Today HEBE watch company is ranked as one of the largest watch manufacturers, that present the watches of a high quality and great design. 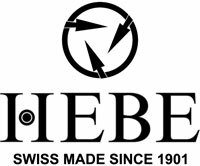 Since 2011 the watch company HEBE has new management, which tries to give a new dynamic to the brand and replace it to the highest scene of luxury watches.